Have you ever been asked the question “quick, I need to know how much free space there is in the Nodrap database on server Cromulent”? Ever wished that you could quickly grab that information? You might well have a TSQL script that will grab that information for you. I’ve been working on pulling that information centrally, grabbing that data for multiple servers becomes a much simpler task when using PowerShell. Why PowerShell and not TSQL? For me the big bonus that PowerShell provides me for grabbing this data is that I can pull it quickly and easily, I can also simply run it for multiple machines and the same script works for versions SQL 2000 and up. To get a list of databases, their sizes and the space available in each on the local SQL instance. Very quick and easy. The information here is a little misleading though. 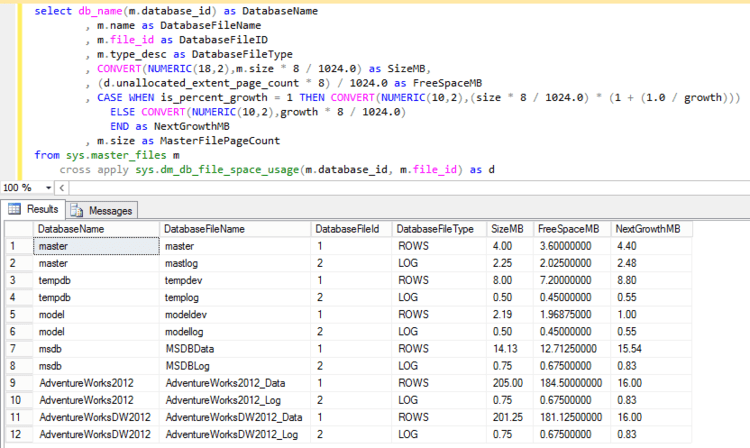 The Size is the size of the database and includes size of the transaction log(s). 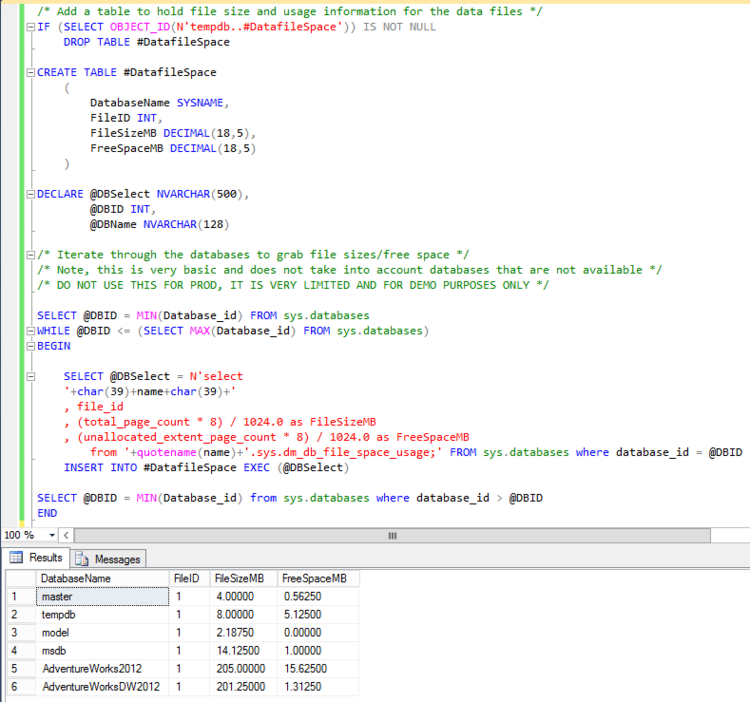 SpaceAvailable only represents the space available in the data files however, unless we’re looking at SQL 2000 in which case it’s the free space in the data and log files. To make things even more confusing Size is reported in MB and SpaceAvailable in KB. To get more details we need to look at the transaction log information. How big is my transaction log? To grab this information we need to go deeper. In this case we will focus on the AdventureWorks database. This information is all in KB which helps have it make a little more sense. Now we have the size of the database, the size of the log and the free space in each it’s some quick math which gives us the sizing information. Running all this and grabbing the data from different areas can lead to messy results. This is where the PowerShell DataTable come to the rescue. 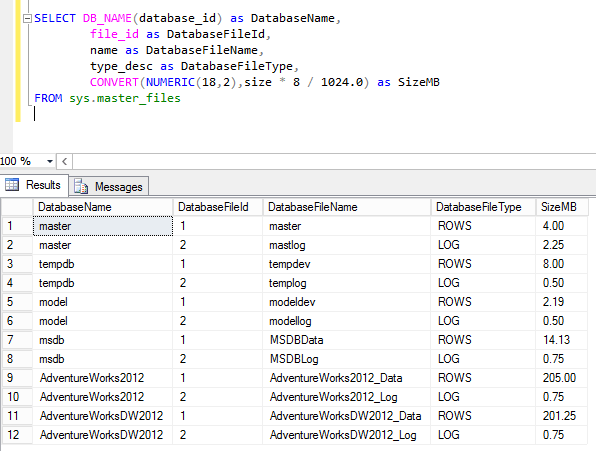 A DataTable is a PowerShell object, much like a SQL table that can hold data for you. 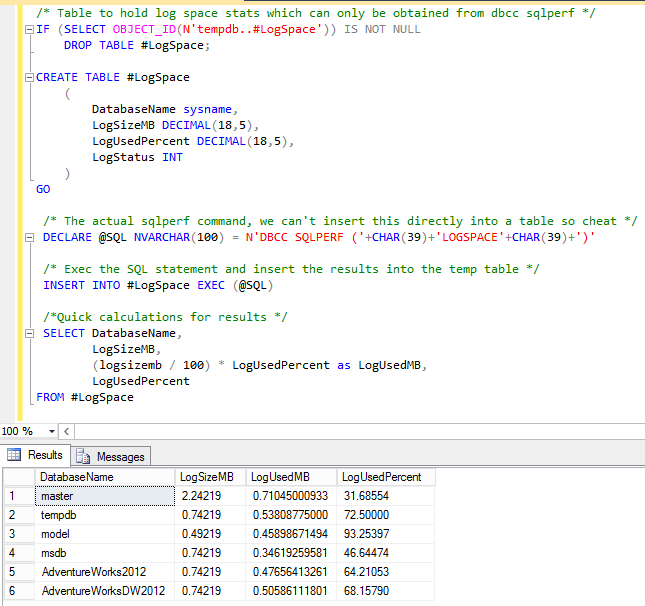 First you create the object, define and add columns and then add rows before finally returning the data. $dataTable = New-Object system.Data.DataTable "SomeStuff"
$row.FunkyText = "Something really funky"
$locationFixed = $location -replace "[. ]", "%2e"
$dataTable = New-Object system.Data.DataTable "Results"
In a follow up post I’ll show how we apply a minor tweak to the script and have the data loaded into a SQL database.